Glamorous camping … glamping? I’ve earned it. 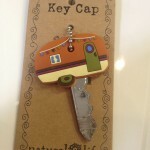 My name is Sarah Taylor and my childhood vacations were spent camping in a tent with my family. We’ve camped all over Florida, out to the Grand Canyon, and up to the Adirondacks. Camping and the great outdoors are in my blood. So when I say I’ve earned it, I mean that I’ve done my time and can now bask in the hum of the A/C on our Aistream camper. 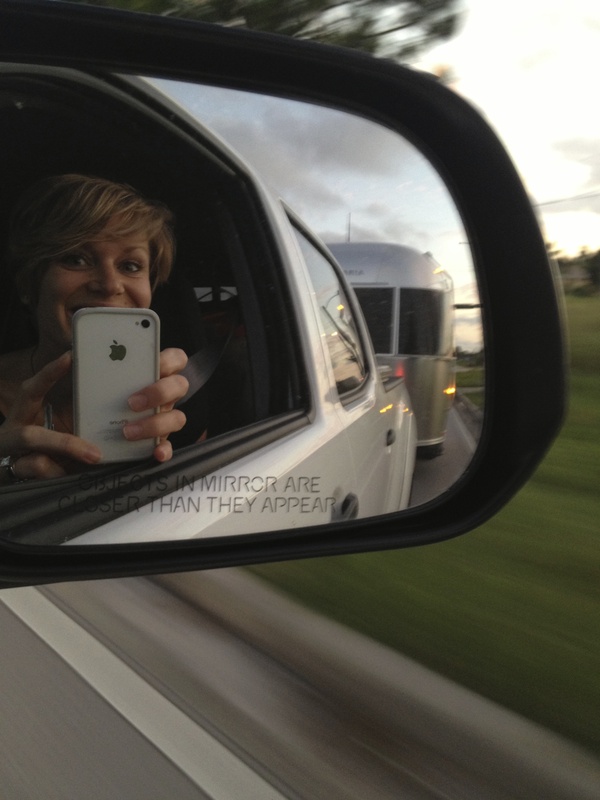 My husband Frank and I bought a used 16′ Airstream travel trailer in late 2013. The smaller Airstreams are dubbed “Bambi” so that’s her name. Objects in mirror are shinier than they appear. Bringing home Bambi. Other than the trendy word glamping, the real meaning here is GONE. For four years up until 2013 I allowed volunteerism to consume my spare time. I climbed the ranks of leadership within my trade association and finally stepped back to look at where I was. I’ve met great people, traveled to awesome places, but I’ve been at the mercy of other’s schedules. My vacations would revolve around committee meetings and there were times where I’d be gone for a week away from my husband. 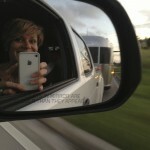 I joked and said I was going to get an Airstream and travel the country. Then I finally said no more. In September 2013 my friend Mindy said she believed in me and understood why I wanted to unplug a bit. 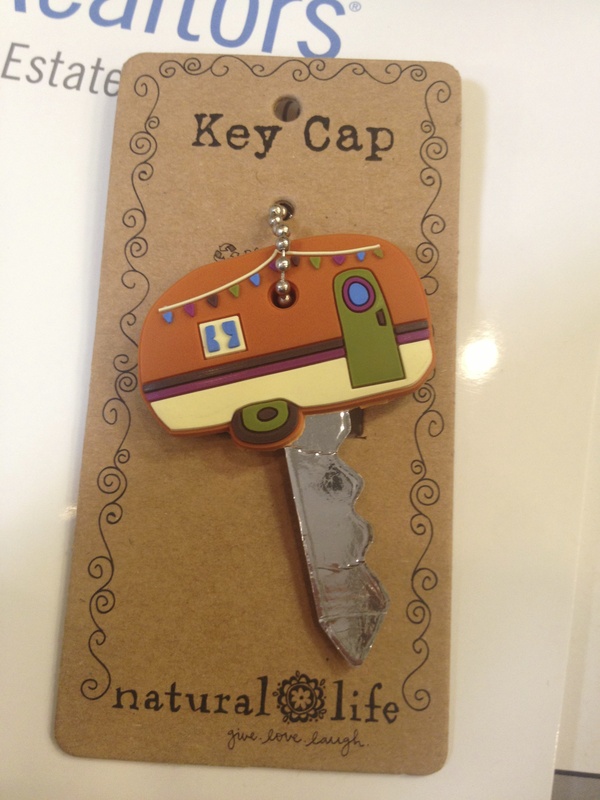 Then she surprised me with a camper-shaped key cap. Now I had something small and tangible that identified with I’d been telling everyone. A few weeks later Bambi showed up on our local Craigslist and the rest is history. It’s hard to say no when others praise your capableness. I had a lot of “no” conversations in late 2013. And every time I had to tell a friend why I couldn’t serve on their committee I would remind myself of my shiny Airstream sitting in the driveway at home. It was a symbolic reassurance that I was making the right choice – for myself and for my family. My intentions for this blog are to write about our travel experiences with Bambi as well as reflect on some of the memorable camping trips from my youth. Hell, I may even throw in a few tips, tricks, and recipes that we’ve learned along the way. Come on in, poke around, and I hope you are inspired to get out in the wilds.